Congratulations to group members Marie, Matt, Alix, and Fang for successfully passing their qualifiers and advancing to Ph.D. candidacy this quarter. Q. Li, E.Y. Chen, D.R. Bice, and D.C. Dunand "Mechanical Properties of Cast Ti-6Al-2Sn-4Zr-2Mo Lattice Block Structures ." Advanced Engineering Materials 10 (10) 939-942 (2008). Congratulations to former group member Christian Greiner who was recently awarded the von-Humboldt fellwship. In January he will begin work at the University of Pennsylvania with Professor Robert Carpick. President Bienen named Profs. Mark Ratner and David Dunand co-directors of the new Initiative for Sustainability and Energy at Northwestern (ISEN) which will be supporting research, teaching and outreach at NU in these critical areas. Read the official announcement here. Welcome to Anselm Neurohr and Page Peiqi Zheng, the newest members of the Dunand group! P.J. Kwok, S.M. Oppenheimer, and D.C. Dunand "Porous Titanium by Electro-chemical Dissolution of Steel Space-Holders." Advanced Engineering Materials 10 (9) 820-825 (2008). K.A. Erk, D.C. Dunand, and K.R. 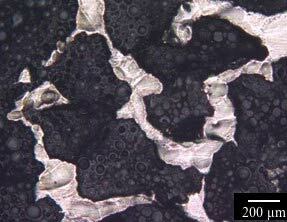 Shull "Titanium with Controllable Pore Fractions by Thermoreversible Gelcasting of TiH2." Acta Materialia 56 (18) 4953-4954 (2008). David Dunand has received the 2009 TMS-SMD distinguished scientist/engineer award which recognizes an individual who has made a long lasting contribution to the fundamental understanding of microstructure, properties and performance of structural materials for industrial applications. Prior recipients are listed at: http://www.tms.org/Society/Honors/SMDScientist.html and include Prof. Greg Olson from NU. 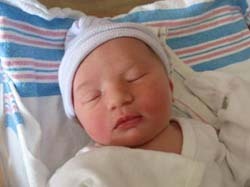 Congratulations to Group alumnus, Chris Schuh, and his wife on the birth of their daughter, Meredith Christie Schuh, who was born July 17th at 5:10 AM. She weighs in at 6 lbs, 13 oz, 19 inches long with blond hair, and, at least for the moment, blue eyes. Marcus was recently awarded the 2008 Acta Student Award, reflecting outstanding articles published in Acta Materialia in 2007, one of the top journals in Materials Science and Engineering. Marcus was co-advised by Dr. Dean Haeffner at Argonne National Laboratory. The three papers for which he was nominated report on experiments carried out at the Advanced Photon Source. Marcus will attend the presentation ceremony which will be at the joint MS&T Conference in Pittsburgh in early October. Congratulations! Rick and Ampika took part in last week's PhD hooding ceremony. Check out some photos here. Congratulations to Dunand Group alumna Megan Frary for being awarded the 2008 ASM Bradley Stoughton Award for Young Teachers. She received her MS and BS with the Dunand Group before completing her PhD with Chris Schuh (another group alumnus) at MIT. Knipling, K.E. ; Dunand, D.C.; Seidman, D.N. "Precipitation evolution in Al-Zr and Al-Zr-Ti alloys during aging at 450-600°C"
Congratulations to Ampika for successfully defending her Ph.D. thesis! Congratulations to Dr. Olivier Couteau and his wife on the birth of their son, Emir Couteau. He was born in Leige and weighs in at 3.5 kg and 49 cm tall. Former Dunand Group member and current Danae and Vasilios Salapatas Associate Professor of Metallurgy at MIT, Chris Schuh, was this year's keynote speaker at the annual John E. Hilliard symposium. His talk was entitled, "From the Ivory Tower to the Factory Floor: an NU Metallurgist Tries to Vertically Integrate." M.E. Krug, D.C. Dunand, and D.N. Seidman: Composition Profiles within Al3Li and Al3Sc/Al3Li Nanoscale Precipitates in Aluminum. Applied Physics Letters. 92, 124107 (2008). 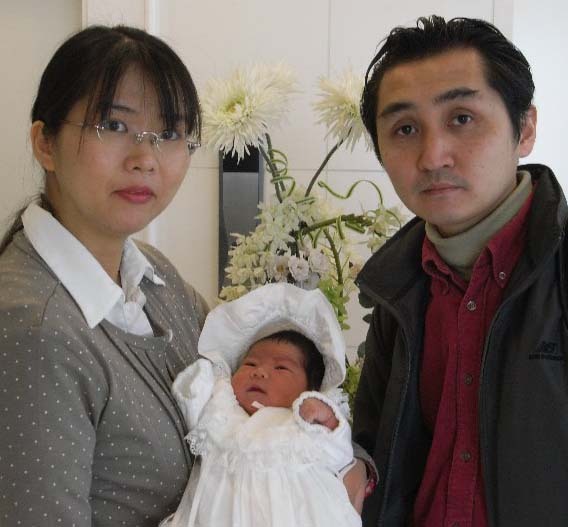 Congratulations to former group member, Yasumasa Chino on the birth of his daughter, who was born on March 4 and weighs in at 3,775 g.
Northwestern University's McCormick News, Boise State University's UPDATE, and Technology Review at MIT (from which co-authors Vee and David are alumni).